Build Credibility: It is best to start a blog on a subject that you are an authority on. Be it fashion , spirituality, technology or just procrastination and laziness. After blogging took over our social media news-feeds, we see common people endorsing thing/ products which they prefer or would recommend people to try. In a world of Snapchat and Instagram filters, where everything can be edited and be made to look good, and Photoshop dominating them all, it’s hard to trust and figure out what is true and what is a ‘filter’ view. It helps when you know the individual is credible on the subject. Have A Point: Pick a unique perspective to showcase or be the absolute best in the industry … especially if you are venturing into a crowded field. i.e., food or travel. If you cannot break into the top ten then be content with the fact that only your friends and family will read the post. Your content needs to have a unique perspective or a point that will resonate with the audience at large. Variety is the Spice of Life: That holds true for the blogging world true. 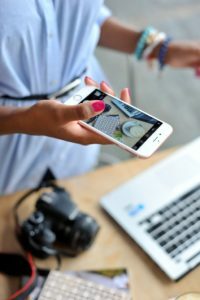 There is still a majority of people who believe blogging is nothing beside taking photographs and posting it on social media. Use different mediums to engage your audience. Videos, podcasts, posts, pictures, live chats, hangouts and twitter chats are just some of the way to build and engage your audience. Use a mix of mediums that is best suited to your subject and blog. Revenue Source: Evolving from a leisure activity of sharing one’s passion or liking towards a certain activity, blogging has taken a great turn and has become a career choice for a lot of people as well. There was a time when we would list blogging as a part of ‘Hobbies & Interest’, but since the last three to four years it is just as likely to be found under ‘Work Experience’ on the same document. If you are to make this a career choice , you need to think carefully of how you will monetize your blog without compromising on the credibility. That is one of the biggest hurdles in the same. Barter deals work only up to a certain level…they certainly don’t pay the bills. Unless of course your gardener and cook is good with payment in freebies like : food packets, oil cans or phone samples. Every blogger tackles it differently. Either they let the audience know that this is sponsored content or create visible branding for a brand. But you need to let your audience know. Consistency: The audience is fickle. A nameless and faceless one even more so. Its like the petulant kid with a ADD or an intellectual child who looses interest if there is no intelligent response from the other end. The key is response – relevant to the subject and at the right time. Or rather I like to put it in one word : Consistency. Your posts need to be regular and consistent. Your engagement with your audience even more so. Good bloggers are dedicated and have a regular schedule that makes it easier for their audience to find them. Else it’s like your favorite sitcom on the telly is playing hide and seek with you every day of the week because you have no idea when the next post is due. « Is all innovation creative ? » Is traditional media losing sheen ?